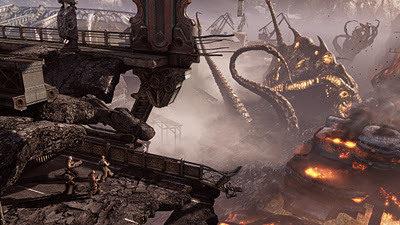 Seems rather fitting that the developer behind the genre-defining Gears of War 3 is called Epic Games because if there ever was a video game describable as poetry in motion this would be it. Albeit a gritty, gruesome poem filled with despair, destitution and desperation. Don't tell me you were expecting rainbows and lollipops? It's been nearly three long years since fans have had a chance to play a new Gears of War game, and the wait has been worth it. 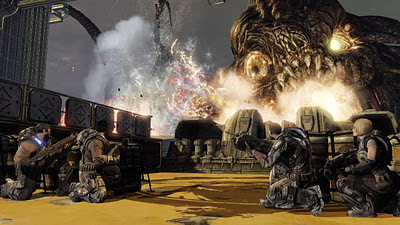 Our war-torn hero Marcus Fenix and the now beard-sporting Dom return to continue their bloody crusade to stop the Locust Horde, and the even more deadly Lambent creatures, in a three-way battle that spills more red juice than a Saw marathon night. Equipped with their signature chainsaw-teethed Lancers, the Coalition of Ordered Government﻿ (aka COG) soldiers, or what's left of them at least, receive word that the thought-to-be-deceased father Adam Fenix has actually been kidnapped and is still alive. A retrieved data disc shows that Adam is not only alive, but may have a means of wiping out the new Lambent threat that is poisoning the world with their highly reactive yellow Imulsion goo. Graphically, Gears of War 3 doesn't stray too far from its predecessors, which is certainly welcome here. The Unreal Engine which powers this game presents some of the most fluid and high fidelity graphics you'll see on a home console, and this time around the crispness is even more defined. The mostly greys and browns that permeates the ravaged world of Sera still take up the majority of the game time, however a lush tropical environment, an immersive underwater chapter and a richly detailed Thrashball stadium set piece provide some much-needed visual variety. 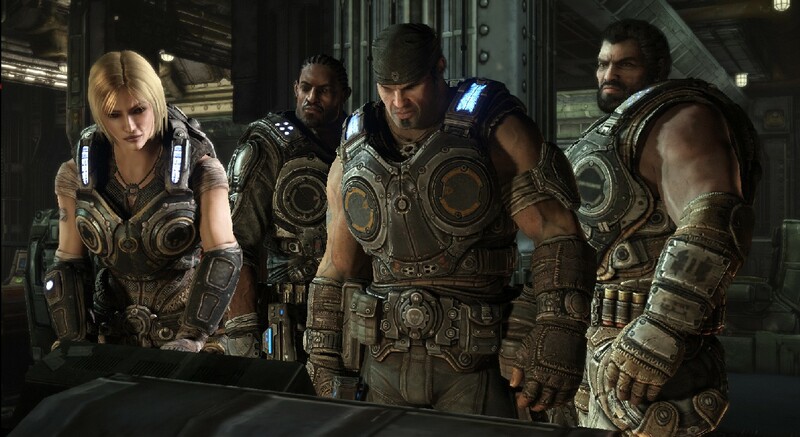 If life on Sera was rough in Gears of War 2, this time around it's all-out hell. The survivors and Stranded that populate this world distrust the COG even moreso, and justifiably so after the Hammer of Dawn rainfall and the sinking of last remaining safe haven, Jacinto. Every encounter with denizens of the makeshift outposts is visceral and more believable than in the last two games, and overall the world of Gears of War 3 is more grounded. While the story has its predictable moments, the dialogue is better also, although it rarely surpasses the cliche one-liners you'd hear in an 80's Stallone film. This is Gears of War people, not Shakespeare! The highly explosive Lambent creatures add a distinct visual flair in this war adventure, and sometimes their violent discharge upon death literally shakes whatever foundation you're standing on. Their yellow gunk sticks everywhere, leaving most battlefields a mucusy mess. Particle effects are top-notch, culminating in the best smoke effect you'll see in a console game, along with superb yellow beams of sunlight that reflect elegantly on varied surface types, and the partially destructible environments that look really cool as they crumble and crack. Did I mention the Campaign is awesome? Well it is, even though it doesn't break a lot of new ground. Epic Games played it safe and did what they know, refining here and there, while never really creating any new jaw-dropping moments like the first time we saw a Berserker in Gears of War 2, but it's still solid all the way. The Campaign can be played local split-screen co-op, online co-op, and even 4-player online co-op for the very first time. Trust me, it's way easier playing with a partner, although the AI controlled players are remarkably smart in this game, even killing all the grunts while you focus on eliminating the boss target or flip some switches. For an added challenge, Campaign mode includes an Arcade option which adds a point system to each chapter and encourages friendly competition amongst teammates. Oh did I mention multiplayer? 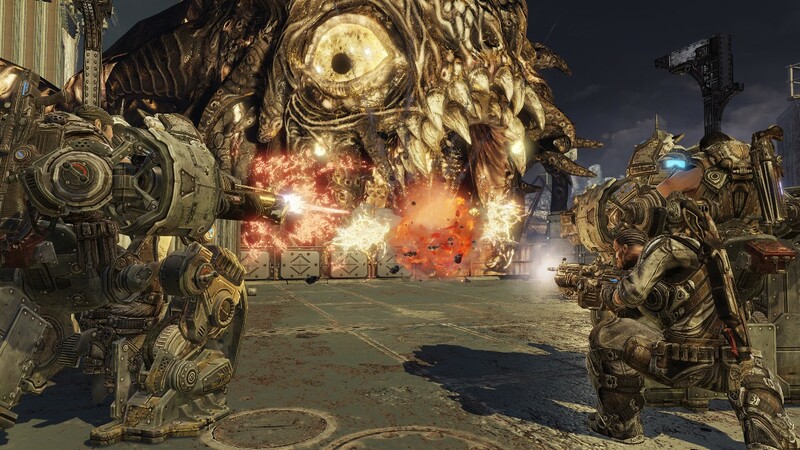 A Gears game wouldn't be a Gears game without well-thought out and robust multiplayer modes, to which it has in spades. I know, I know, Gears of War 2 had a lot of problems with its online multiplayer, but believe me these shortfalls received a lot of attention this time around. Matchmaking is simple, intuitive and quick, and the menu system has never been easier to navigate. First up we have Versus mode which contains seven game type variants including Execution where eliminations can only happen through executions, the self-explanatory King of the Hill and the two-player teams in Wingman. Team Deathmatch gives opposing teams of four a pool of 20 lives each, which eventually winds up being a last-man standing type scenario. Whereas in the campaign you'll mostly be running and stopping, in Versus mode you'd best not stand around too long or you'll find an enemy sawed-off shotgun pointed squarely at your head. Teamwork really plays a central role in Team Deathmatch since each death drops your life count by one, making revival all the more central to your game strategy. Horde mode returns and pits up to four players in a 50 wave battle with increasingly more challenging flocks of enemies. Round one begins with more benign creatures such as the squirrely Tickers that claw at your knees and the slow and lumbering Butchers with their oversized meat cleaver. Every ten rounds you'll encounter a boss battle and wage war with the most menacing Locust and Lambent foes the game has to offer. Some of these bosses are a few stories tall and have ample firepower to mop the floor with your remains, so careful strategy is required to overcome them. Blurring the line between a third-person action and a real-time tower defense game is a new monetary system that rewards players with cash for each kill or enemy down you perform which can be used to build fortifications. Defenses include barriers that slow down and harm enemies, decoys that distract and confuse them, and turrets and sentries for intense firepower. Horde mode itself is probably enough to justify getting this game. Beast mode is the just the inverse, you play as the Locust and Lambent armies as you march towards the human holdouts with guns, spiked maces and meat cleavers in fist. As you fight through 12 rounds of successfully more challenging opposition you gain access to even more powerful brutes such as the heavy bombing Boomers, the creepy Giant Serapede and if you really want to raise hell there's always the (nearly) unstoppable Berserkers. All the while you're playing each mode there's a Level-up system that ups your rank as you gain experience and win victories. As you progress through levels you'll unlock new weapon skins, characters, weapon executions and special mutators that alter the gameplay in some manner. With such a robust level-up system you'll be playing all modes of Gears of War 3 for some time to come. As if all this wasn't enough, there's even a handful of new weapons to play with including the Retro Lancer, a variant that includes a bayonet at the tip and can be ram full-speed into your opponent's gut. There's also the Digger which shoots burrowing explosives as it travels underneath enemy cover and as mentioned above there's the Cleaver, which is essentially a butchers knife on steroids. 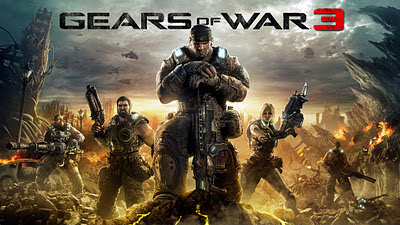 If it's not clear by now, Gears of War 3 is unquestionably a must-have game for fans of the series or the action genre. It's easily worth the cost of admission and ultimately the biggest challenge is juggling your personal time for the first few weeks you have the game because you'll want to play it over and over again. The multiplayer modes are insanely fun with a few buddies and there are enough unlockables, hidden collectibles and Easter eggs to keep you busy for a long time to come. While the Marcus story arc has come to an "end", and the epic trilogy over, there's no bigger final bang than what we have here. Bring on the DLC!